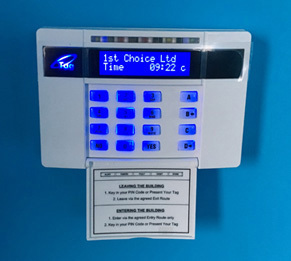 If you are considering installing an intruder alarm system in Hitchin on commercial premises, there are a number of things to take into account. If you have a relatively small business such as a baker’s shop or newsagents it may be tempting to consider purchasing an off-the-shelf system and installing it yourself, but for proper security this is not a good idea. Business security systems in Hitchin need to be designed to ensure that all likely points of attempted entry into the premises are covered and that movement within the premises is also detected. Our consultant will conduct a survey of your premises to identify the level of risk and establish the amount of protection required. This can range from a simple bell-only system of external and/or internal audible alarms to a fully monitored system where a warning is communicated to an external monitoring station or to the police who will take appropriate action. All of the surveys that we undertake with respect to an intruder alarm system in Hitchin are carried out without obligation. All members of our staff here at 1st Choice Security Systems are CRB checked which qualifies our engineers to operate in places such as schools and other high security premises, and we are a ISO9001.2008 and Safe Contractor approved business. 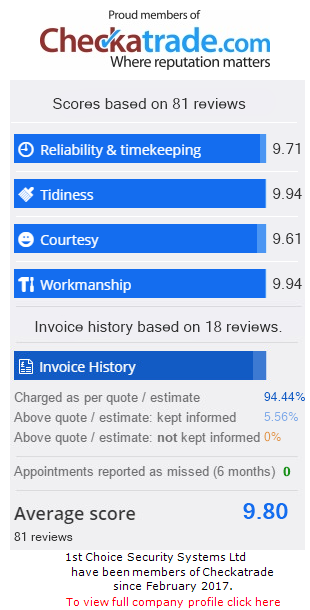 When surveying your premises our consultant will need to know if you keep valuables on the site, and about your habits, which is another reason to use a company such as 1st Choice Security Systems which you know is a trusted and reliable installer of an intruder alarm system in Hitchin. What Sort Of Detection Devices Are Used? The detection devices that are used in our commercial security systems in Hitchin are mostly movement sensors such as Passive Infra-Red detectors which pick up the movement of a warm object – in this case a human being – and magnetic door and window contacts which activate when the door or window is opened. However, Dual Technology sensors are increasingly being used. These contain both a Passive Infra-Red detector and a Micro-Wave – or radar – detector, both of which must be tripped. This technology helps to avoid false alarms. Additional devices may be attached to an intruder alarm system in Hitchin such as a fire alarm or water leak alarm if they are required. Of course, an additional and valuable tool is the use of a CCTV system. CCTV systems can be connected to the intruder alarm system and the images can be transmitted to a monitoring station for viewing and response. In addition, now that CCTV images can be created in high definition they can be accepted and used as evidenced in court.